All though most people may know how to set this up I wanted to post this for those that may not know how. 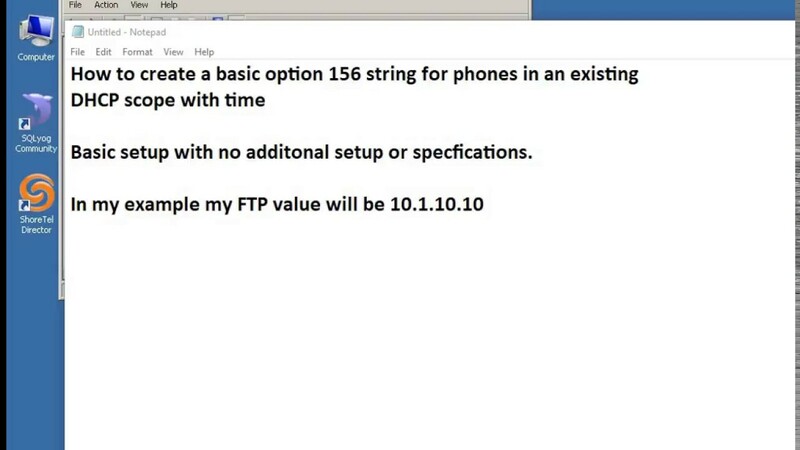 Option 156 is a DHCP option that is responsible for handing out critical information to phones thru DHCP. This DHCP option is not built into windows within the predefined options and therefore must be created and configured for your use. Step 1 Open DHCP Manager on your Microsoft DHCP server. Step 2 Right-click the DHCP server, and select Set pre-defined options. NOTE If your organization is separated into separate subnets, make sure to select the proper subnet. For example, if you have a global organization and would like to configure the DHCP server to deliver the Spanish tones and cadences only to theIP phones in your office in Spain, you should make sure to select that particular subnet of users. If you do not specify the subnet, then all phones that boot from this DHCP server will receive Spanish tones and cadences. Step 4 Set Name to IP Phone Boot Server. Step 5 Set Data Type to String. Step 6 Set Code to 156 and add a description, if desired. Step 7 Navigate to the scope options and add option 156. Last edited by Lance; 02-14-2018, 05:25 PM. Options can be configured on multiple types of a devices and this process is not limited to a windows server. option 156 ascii "ftpservers=172.16.4.20,layer2tagging=1,vlanid =4"
Last edited by Lance; 02-09-2018, 11:15 AM. Good stuff from Lance, as usual. Thanks for this info, I am sure many people will use this! 7. Under DHCP Generic Options, Choose your 'Shoretel_group', and click OK.
Had to do this yesterday and wanted to make sure people could find how to do it. Just something to add, 'configservers=x.x.x.x' should be in the default string regardless on Onsite/Cloud if you're using 400-series phones. This is what the 400-series use the boot and if missing, will revert to the 'ftpservers=x.x.x.x' setting. However, in later versions of Connect, ShoreTel/Mitel changed this and if the 'configservers' setting isn't present, the 400-series phones won't be able to contact the HQ server to pull down their configuration. Found this out from a few customers upgraded from 14.2 to Connect and were missing this string.